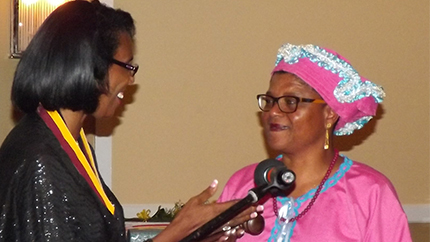 International Visitor Leadership Program (IVLP) alumna Jane Winifred Smith was elected President of the Association of Caribbean University, Research and Institutional Libraries (ACURIL) during the 44th Conference of ACURIL in Nassau, Bahamas, held June 8–12, 2014. This marks the first time the ACURIL presidency has been occupied by Suriname. To honor the historic election, the 45th ACURIL Conference will be held in Paramaribo, Suriname in June 2015. The theme will be ‘Collaborative Continuing Education: LEARN, ACT AND INSPIRE.’ ACURIL anticipates that approximately 200 library, archive, and museum professionals will participate in the conference. Jane is Director of the Library at the Anton de Kom University of Suriname, and has been on the ACURIL Executive Council since participating in her 2008 IVLP program. Her IVLP participation, which focused on “Library and Information Science,” helped expand her knowledge of information services, and finessed her leadership abilities.